Restaurant Virginia Beach: Pizza Night! 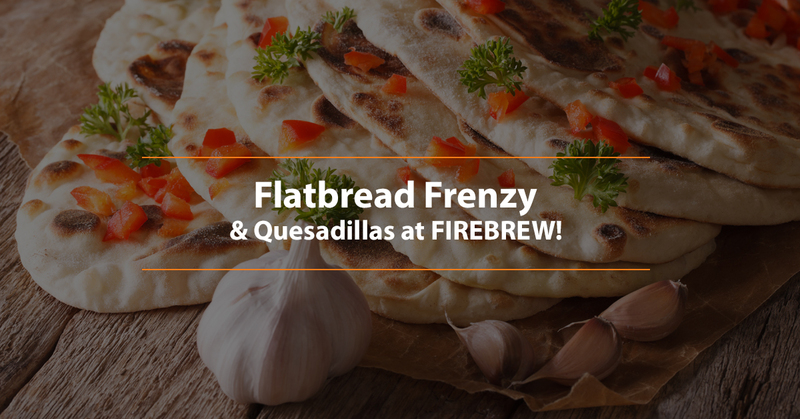 Flatbread Frenzy and Quesadillas at FIREBREW! In an earlier blog, we described all the incredible pizzas you can order when you stop in for lunch or dinner at FIREBREW Bar & Grill! Our restaurant takes pride in never microwaving or frying your food. Instead, we cook everything over our open flame oven and serve it to you fresh. If that isn’t enough, our kitchen is located right in the center of the restaurant – meaning you and your family will be able to watch your food being cooked no matter where you are seated! When you are craving some Virginia Beach pizza from your favorite restaurant, come to FIREBREW Bar & Grill! We love flatbreads, which is why we offer some delectable favorites! This flatbread is covered in tequila mango BBQ sauce, flat iron steak, caramelized onions, grape tomatoes, and mild cheddar & Monterey Jack cheese. All of this is piled onto the grilled garlic herb flatbread and drizzled with a chipotle aioli sauce. Looking for a tasty flatbread you’ll be talking about for days? Try our pesto chicken flatbread! Pesto sauce, grilled chicken, roasted tomatoes, fresh basil, and a house cheese blend all come together to create the perfect flavor. With all of that spread out on a grilled garlic herb flatbread and drizzled with a balsamic glaze, we know you will be satisfied. Looking for a spicy kick to take your meal up a notch? Check out our buffalo chicken flatbread today. With grilled chicken, blazin’ hot buffalo sauce, blue cheese crumbles, diced tomatoes, mild cheddar, and Monterey Jack cheeses all together on that grilled garlic herb flatbread, we know you’ll be coming back for more. The final touch? We drizzle a chipotle aioli over the top. If flatbreads aren’t really your style, it might be time to check out our quesadillas. This quesadilla has grilled chicken, corn, black beans, tomatoes, Baja seasoning, and mild cheddar & Monterey Jack cheeses! All of these ingredients tucked into a grilled flour tortilla and served with southwest ranch dressing and mango salsa makes this a meal you don’t want to miss. Get a little taste of the sea with a thin layer of creamy crab dip topped with sauteed shrimp, diced tomatoes, Baja seasoning, white onions, mild cheddar, and Monterey Jack cheeses. We grill all these ingredients inside a flour tortilla and top it with chipotle aioli with mango salsa on the side. Looking for something unique tonight? Try some chipotle steak on a quesadilla! This quesadilla is filled with flat iron steak, mushrooms, onions, red and green peppers, mild cheddar, Monterey Jack cheese, and chipotle aioli. You can enjoy this quesadilla with mango salsa and sour cream! If you are looking for an incredible and fresh meal today, then stop on into FIREBREW Bar & Grill! All of our food is made fresh, so you can be sure that you and your family will love whatever you order each and every time we see you. We will see you tonight for dinner.